Yesterday was Native American Day, and since my son has shown interest in learning about Native Americans in the past, I thought he would enjoy commemorating the day. These are just a few easy things I was able to do without much planning. We read a book from our own library, The Very First Americans. We’ve read it several times, and it’s a great starter book for understanding who the Native Americans are. I had my son watch this very short video on National Geographic. 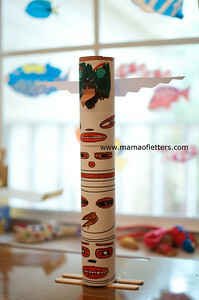 We did this totem pole craft that you can see in the photo. My son loved it, and he’s very proud of his creation! You can get the easy instructions and template here. This is my son’s story he made up for his totem pole: The eagle at the top is protecting a lake from the two monsters (just below him). The two faces on the bottom help the eagle protect the lake and keep the monsters from stealing all the water from the animals! Well, he told it much better, but you get the drift! There were also some cool events happening at some Georgia State Parks today, but we’ve been so busy, I needed a day at home! I also think it’ll be easier to attend things like that when my three-year-old gets a little older. Perfect timing! We are studying Native Americans for a project coming up in November. Thanks for the links and book suggestions. Thanks, Sarah! I’m glad it’s helpful.